Tyler Berger wrestles Steve Bleise from Minnesota. Nebraska senior Tyler Berger finished the 2019 NCAA Tournament as a national runner-up. He finished his tremendous career with a 116-32 record which puts him in ninth all-time in the Nebraska record books. Berger was a four-time national qualifier and a three time All-American. He finished fifth as a sophomore and third as a junior before his second place finish this season. He was 28-4 this year with three of his losses coming to National Champion Jason Nolf from Penn State. Berger was ranked #2 for most of the season. After an early season loss at the Cliff Keen Invite, Berger followed it up with wins over #4 Hayden Hidlay from NC State and a win over #2 Ryan Deakin from Northwestern the following week. In January, Berger lost his first to Nolf, then followed up with five straight wins over top 15 wrestlers. He finished runner-up in the Big Ten tournament to Nolf before being the two seed at the NCAA tournament. On Sunday, Berger was recognized as the Husker Male Athlete of the Year. He has been a four-time academic All Big Ten honoree. He majors in Psychology. Prior to Nebraska, Berger was a four-time state champion competing for Crook County High School. The Prineville, Oregon native was 198-3 and ranked #6 in his weight class. In 2013, he was voted the Oregon Athlete of the Year. Why did you choose Nebraska? I chose Nebraska for a couple reasons. I always dreamed of wrestling in the Big Ten. I never shy away from great competition. I wanted to wrestle the best competition week in and week out. Another reason was Jordan Burroughs and James Green, I wanted to learn from them, see how they conduct themselves and go about their business, and I wanted to wrestle them. Ultimately the biggest reason, Coach Manning came to Oregon to visit me and he had so much energy and was so fired up about wrestling. I saw something in him I see in myself. I figured he would get the best out of me. How big of a change was it for you coming from Oregon to Nebraska? There were a lot of changes. It was a big change in scenery going from the ocean and mountains, to Nebraska where it is pretty flat. There is a different culture. It was a big move at 18. I had not been on my own much. I had a lot to learn, it was a big transition. I developed pretty quickly because of it. It forced me to grow up, get my school and relationships in order. I think the first year was so important for me and it really set me up for the next four years. After the first year, I loved it here though. I love the culture, the environment, the people, and I love Lincoln. Wrestling in a room with Dudley, Kokesh, Burroughs, Green, Maple, Snyder and so on, what was that like? How did it prepare you for competition? I have had so many great people around me, they showed me how to do everything the right way and paved the way for me. I am surrounded by greatness. For me, I just showed up ready to work, everything else was provided for me. Nebraska spoils us with diet, facilities, training table and the coaches. I look up to those guys, they all helped me in so many ways. I cling to great leaders. It’s one thing to be great on the mat, but to be a great friend, father, husband, brother, they are great people. It is easy to be a part of this program. Who has had the biggest influence on you over your time at Nebraska? That’s a tough question, it was not just wrestling. Of course there’s the coaches, Manning, Snider, and Maple. Jordan and James had a huge impact on me. My old roommate, Eric Montoya, had a huge impact on my career. He showed me a different level of tenacity and discipline. Seeing how mean he was, and how badly he wanted win was a huge. 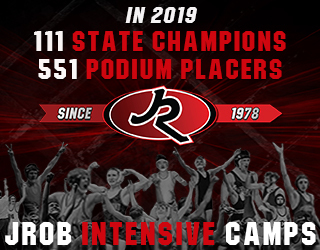 Robby Trent, the head of the FCA leadership group had a huge impact on my life off the mat. It helped me in my wrestling too. He walked me through some dark times and showed me how to be a man of God, how to be faithful, and how to be passionate. He taught me to pursue God’s glory, not my own. He was a huge part of my growth during my time at Nebraska. Now that you are done with wrestling for NU, What do you look back on and take most from your career? The lifestyle I grew into. I look at how I came in as am 18 year old boy. Now I’m a 23 old man. There is different level of excellence I learned from guys surrounding me. There were highs and lows, but ultimately it prepared me for the next step in life. I just took the toughest loss of my career, but I always pursued something bigger than wrestling. I don’t want to be known just as “Tyler Berger the great wrestler.” When I leave, I want to be known as a great person. I have grown into a man and learned to give to others, and be a leader. I want to step into coaching. I am on the fence right now about wrestling. I am going to take some time off and have not decided where I will end up. I want to stay in the wrestling community and I want to stay in D1 level. Nebraska returns a majority of their lineup next season. How do you see the future of the Huskers being? I think the Huskers are in very good hands moving forward. I wanted to make sure I paved a legacy for the guys. I wanted to make sure they were ready when Jordan, Zeke and I were not in the lineup. I think the guys stepping in will have an immediate impact and compete well. Alex Thompson is a hammer, he is mean. I think he will do very well. Peyton Robb reminds me a lot of myself. Robb was my training partner. He loves to wrestle and he is passionate about it. There will be a lot big guys coming back too who have been All-Americans and competed at a very high level. Who do you see filling your shoes and taking the leadership role? I don’t think I am in the spot to say. I would think it would be guys like Venz, Schultz, and Red. Red will coming back next season with the most accolades. Right now, I could see Venz. He has a little crazy and a lot of toughness in him. After the NCAA tournament him and I had a heart to heart. I know what it was like to be a four time qualifier and not reach All-American. I think he will have a bit of chip on his shoulder. He will come back ready, he will have a big off season, and I think he will shock some people. I know someone will need to be vocal and tough though, not care about being liked, go out there and get after people. What are some changes you would like to see the NCAA make? Get rid of hands to the face. It affected so many matches this year. If we get hit in the face its alright, we can handle that. I also think they should get rid of head gear. I know for me, by the time I got here my ears were already the way they are. We work so hard and are so disciplined, to have a match come down to a hands to the face is kind of soft. It allows refs to get more involved than they should be. We are at war out there, we’re fighting. Let the wrestlers scrap it out and let the best man win. Don’t let a rule change the outcome and determine someone’s future. What would be some advice you would give younger kids who are wrestling and are wanting to compete at the college level? I think they should understand its tougher than they think. There is something to be said about someone who comes into the room day in and day out ready to work. I think its tough with this generation, there is so many distractions, people want to be successful right away. It’s boring, and mundane, but you have to put in the work. You do the same thing over and over and over. You have to be able to humble yourself and be ready to learn. Don’t let your confidence get affected. 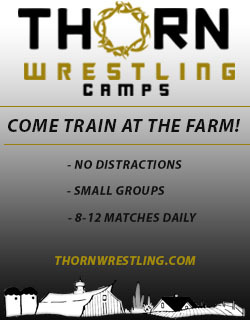 Be a sponge, be in the wrestling room, watch film. If you want to be great, be ready to learn, be a little crazy, be different. Surround yourself with those kind of people. Have courage to do it every day, be comfortable being unconformable. Don’t stop pushing boundaries. Extend yourself, it will hurt and be uncomfortable, but those are the times you have to enjoy. Those times are getting you better. Very select few have it in them, those that do, can make it at the highest level. What would your pitch be for recruits to come to Nebraska? I think for me, and my experience, you won’t find a better staff who will do everything they can do to make you the best you. It’s not just in wrestling, but in life. At end of day, they want to see you be successful, they want the best version of you as a man and wrestler. Some coaches its a business, Coach Manning cares so much for his guys and loves his guys. He loses sleep over wanting to make the best men. We have guys from every part of the country, different backgrounds, and cultures, we blend and grow together. My best friends came from this university, we have a true family here at Nebraska. Nebraska fans are the best in the country, they love and care about you. They give you best student athlete experience you can get. The University really sets you up for beyond college life. Did you find a date for Cancun? That was a crazy thing that happened, It was supposed to just be a joke, but it took off. We had some responses and couple people messaged us. We are going by ourselves though, to support Colton McCrystal and his wife. It’s just going to be a guys trip, and that’s probably for the best. Talking to Tyler was very informative. He was very knowledgeable and loves the sport. He had a great personality and was a fun interview. I can’t thank him enough for the time. He has had an incredible career at Nebraska. He will be remembered for a lot things, A three time All American, a leader, a brother, and an overall good person. Oh yeah, and a kiss to Iowa that will be talked about for years to come. Congratulations on your awards and your success Tyler. I can say for everyone associated with Nebraska, Thank You. April 11, 2019 in College, Nebraska Cornhuskers, Overtime.